All rental facilities and rental equipment managed by the Warsaw Parks and Recreation Department must be reserved in advance. Each facility may be reserved up to a year in advance. Rental fees are subject to applicable sales tax. Contact Heather Frazier at the Central Park Office at (574) 372-9554 ext. 604, Monday through Friday from 7:30 am to 4:00 pm for details. Picnic tables may be reserved in selected parks during the summer for $3.00 each plus tax. When available, they can be delivered to your site/residence for a flat rate of $10.00 each (plus tax) within city limits or $15.00 each (plus tax) outside city limits, but within Wayne Township. Picnic tables, which are delivered to a residence, will be at that location for 1 full week (Monday to Monday). Table measurements are 8 feet x 28 inches. Tables can not be delivered out of Wayne Township. Tables are only available for rent from April 15th through October 1st. Sawhorse tables may be reserved for garage sales during the summer and delivered to your residence within certain guidelines. Reserved tables are available for a flat rate of $8.00 each (plus tax) within city limits or $12.00 each (plus tax) outside city limits, but within Wayne Township. Similar to the picnic tables that are delivered, you will have them for a full week (Monday to Monday). Table measurements are 12 feet x 3 feet. Tables can not be delivered out of Wayne Township. Tables are only available for rent from April 15th through October 1st. Additional park shelters are available for rent. Accommodations will vary. Fees are $35.00 each plus tax. These parks include Beyer, Bixler, Kelly, Kiwanis, and Richardson-DuBois. Shelter rental times are all from 7:00 am to 10:00 pm, and each shelter holds approximately 40-50 people. Shelters are only available for rent from April 15th through October 1st. 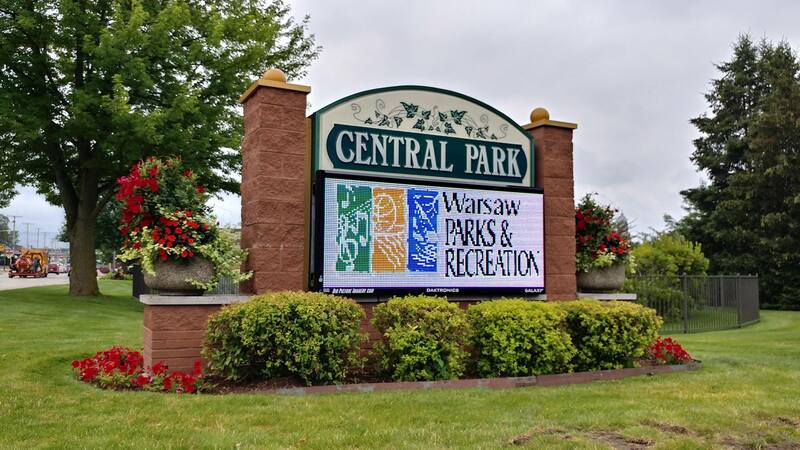 The Central Park Marquee is available for rent only when accompanied by rental of a Warsaw Parks Department facility. Cost is $20.